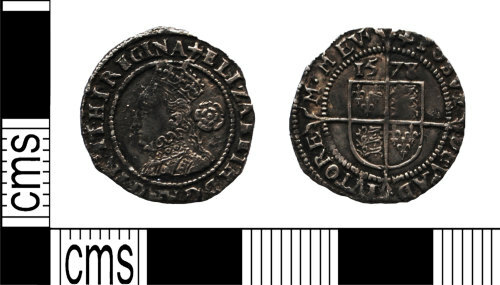 Silver post-medieval hammered threepence of Elizabeth I, dating to 1578. Fourth issue, greek cross initial mark. Obverse of left-facing bust with rose behind head; ELIZABETH D G ANG FR ET HI REGINA. Reverse of square shield on long cross fourchee with date above shield; POSVI/ DEV' AD/IVTORE/M. MEV'. The coin is 19.02mm in diameter, 0.73mm in thickness and weighs 1.20g.